We all know that Globe and Touch Mobile “TM” now offers LTE SIM card to their prepaid subscribers at very affordable price. They also give free upgrade to your existing non-LTE SIM for you to experience faster and more stable mobile internet connection. You can also retain your mobile number when you avail their free upgrade by simply visiting at your nearest Globe store. To spice things up, you can get a free 1GB data when you upgrade your SIM so no need to avail the Globe GoSURF promo while activating it. It’s a bit hassle for you to upgrade, but the most important is you can have the same number than buying a new prepaid SIM card. 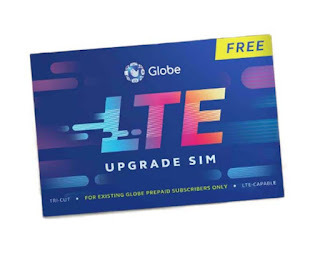 If you have recently purchased a new Globe/TM sim card and you forget to ask if it’s LTE ready, you can easily check if 4G network capable by simply following the steps below. Just text the keyword SIM CHECK then send to 8080. If you have a non-LTE SIM you can show the SMS to any Globe store. How to activate you new Globe LTE SIM? Note: Remember to back up your SIM contacts and messages to your phone's internal or external memory. Just text UPGRADE to 8080 using your old prepaid SIM. Insert your newly claimed LTE upgrade SIM on your phone. Wait for the menu to appear, then enter the 6-digit upgrade code when prompted then press OK. Restart your phone and wait for the confirmation message once your upgrade is successful.